Facebook Wants Great Power, But What About Responsibility? 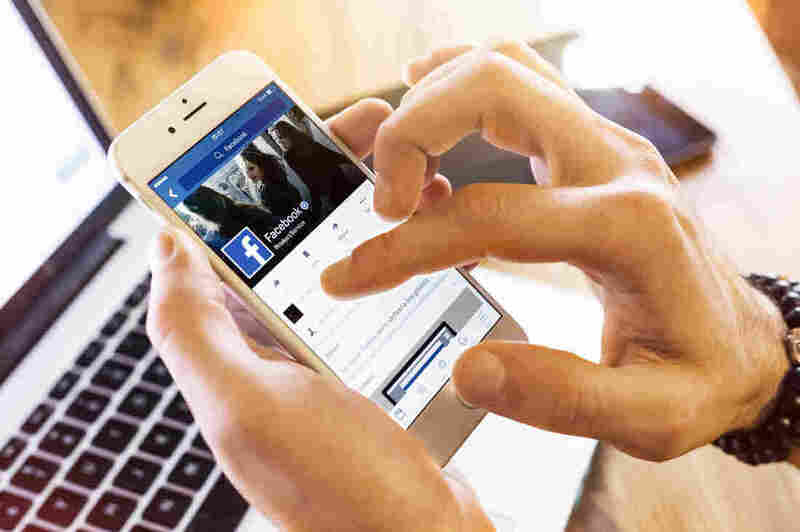 : All Tech Considered Mark Zuckerberg has announced a plan to make Facebook the only primary platform people use to connect to others virtually. But he fails to discuss the responsibilities that come with that power. Facebook Wants Great Power, But What About Responsibility? Facebook claims to have 1.23 billion daily users globally. Mark Zuckerberg recently announced that he wants that number to grow and for users to conduct their digital lives only on his platform. The chief of Facebook made an ambitious announcement last week, though it would have been easy to miss. It came Thursday afternoon — about the same time that President Trump held his news conference. While the reality-TV icon is a genius at capturing our attention, the technology leader's words may prove to be more relevant to our lives, and more radical. Mark Zuckerberg posted a nearly 6,000-word essay to his page, entitled "Building Global Community." Many are calling it a "manifesto." His ambitions are global and his tone, altruistic. Zuckerberg writes: "Our greatest opportunities are now global — like spreading prosperity and freedom, promoting peace and understanding, lifting people out of poverty, and accelerating science. Our greatest challenges also need global responses — like ending terrorism, fighting climate change, and preventing pandemics." Zuckerberg speaks to people who dream of global citizenship, a borderless utopia that many political leaders around the world don't seem to be offering. "In times like these, the most important thing we at Facebook can do is develop the social infrastructure to give people the power to build a global community that works for all of us," he writes. And to build this global community, Zuckerberg encourages us to shift how we think about Facebook: stop looking at the app as a means of recreation. Instead, think of it as the way you connect to others — for work or for play. You can use it as a medium to let the world know about your startup or to recruit parishioners to your church or to announce your presidential campaign or to manage a multinational disaster relief effort. "Going forward, we will measure Facebook's progress with groups based on meaningful groups, not groups overall," he writes. He adds that the strengthening of "meaningful online communities" will "strengthen our social fabric." It sounds noble, but behind that alluring vision is a profound power grab delivered by a savvy politician, say critics. At its core, Zuckerberg's essay reads like a call to give up our open access to the Internet and the freedom that exists in a marketplace with real competition. Rather, Facebook wants us to step into its walled garden — where a handful of company chieftains set the rules — and live our social, economic, and religious lives inside it. What he doesn't address in his essay, however, are the responsibilities that come with this power. Take for example, disaster relief. A well-intentioned nonprofit could try to use Facebook to let refugees fleeing conflict know about safe places to go to for food and water. Now, a group of human traffickers, posing as well-meaning citizens, could do the same. What kinds of resources will Facebook invest in verifying what's real versus fake? Journalists have been surprised to learn that Facebook is concerned with driving engagement — not to be confused with civic engagement. The algorithm that determines what you see in your News Feed prioritizes content that people want to share and comment on, even if it's a lie. Consider how fake news influenced the presidential campaign of 2016. One such story that went viral last fall claimed the pope had endorsed Donald Trump. If Facebook valued real journalism — where resources are poured into the expensive business of fact-checking — its corporate leaders could have decided to implement a simple solution to fake news: make the source for news stories more prominent (so I don't have to strain my eyes to see if it's The New York Times or the National Enquirer). Facebook already does that for celebrities, through the blue verification check mark that tells you the platform has verified and confirmed the true identity of the person. Imagine if Facebook had visually obvious verification for links that come from trusted news outlets. It would do an enormous public service. Facebook's current corporate approach to fact-checking links is crowd-sourcing. Let the users flag suspicious content. It's a system susceptible to warring factions sabotaging each other. And it's not clear from the manifesto that Zuckerberg is willing to change the model to one that pays for essential human capital — far more expensive than software solutions. Small advertisers have been discussed far less but probably have the best insight into Facebook's volatility as a platform. Say I decide to start a page for my tire shop on the site. For the first year, I pay Facebook $5,000 to advertise and the Facebook algorithm shows my posts to all my "followers." But the next year, the company decides to change the rules and say: for $5,000 we will show your posts to 20 percent of fans. If you want to reach the same number you did last year, you have to pay more. These kinds of rule changes — some with dramatic financial implications — regularly occur on the platform. (See for example this change last April that severely limited which users are allowed to post commercial content.) They occur without a user vote and without a public comment period. Right after Zuckerberg posted his manifesto, NPR emailed the company to ask about the new responsibilities that will come with the hoped-for new power Facebook seeks. If Facebook wants people to rely on the platform as the tool to build important social ties online, what guarantees can Facebook give for its own accountability? Can it at least offer something as basic as a customer service hotline, for example? Currently many users who are expelled without clear explanation or who have small business pages removed find it impossible to reach a human at the company for help. A spokesperson did not answer the question, and simply shared the company's press release summarizing Zuckerberg's points.